CD4+ T cells are classified into subgroups such as Th1, Th2, and regulatory T cells (Treg) depending on cell differentiation and functional properties. Recent studies have found that a new CD4+ T effector T-helper 17 cell (Th17), which is different from Thl type and Th2 type, is differentiated by TH0 cells under the stimulation of IL-6 and IL-23, and mainly secretes IL-17, IL-22 and other pro-inflammatory factors. Together with Thl, Th2 and Tregs, they constitute four subsets of CD4+ T cells. It plays an important regulatory role in autoimmune diseases, infectious diseases and transplant rejection . Th17 cells were discovered in 2005 by Harrington et al. . Th17 cells are named mainly based on the cytokines they secrete. The cells were confirmed by establishing a mouse model of autoimmune encephalitis and a mouse model of collagen-induced arthritis. Th17 cells have important implications in autoimmune diseases and defense responses . The discovery of Th17 cells presents a new target for the treatment of autoimmune diseases. In humans, Th17 cells can be identified using cell surface markers for CD4, CD161 and CCR6. Cell markers of Th17 cells can be divided into two categories: Intracellular markers and extracellular markers. Intracellular markers: IL-17A, IL-17F, IL-21, IL-22, RORα, RORγt, Stat-3. Extracellular Markers: CD3, CD4, CD38, CD161, CD194 (CCR4), CD196 (CCR6), IL-1R, TGF-β. The differentiation of Th17 cells is regulated by many cytokines and signaling molecules. CD4+ T cells differentiate into Th17 under the synergistic action of TGF-β and IL-6. The first step in CD4+ T cell activation is the involvement of the T cell receptor (TCR). The intensity of the TCR signal determines the direction of Th1/Th2 differentiation. However, the effect of TCR signaling on the differentiation of Th17 cells is not clear. Different factors have different regulatory effects on the regulation of Th17 cell differentiation. Transforming growth factor beta (TGF-β), IL-6, IL-23 , IL-21 and RORγt play an active role in the differentiation and formation of Th17 cells, while interferon gamma (IFN-γ), IL-4, and cytokine signaling 3 (Socs3), Ets-1 and IL-2 inhibited its differentiation. Th17 cell differentiation mainly includes three stages: induction, amplification and stabilization. In the initial differentiation stage, the initial CD4+ T cells in vivo differentiated into Th17 cells under the synergistic effect of TGF-β and IL-6. IL-6 + TGF-β is sufficient condition for its directional differentiation into Th17 cells . TGF-β plays an important role in the differentiation of Treg cells and Th17 cells. Activated primary CD4+ T cells differentiated into Foxp3+ Treg cells under the action of TGF-β alone; they differentiated into Th17 cells under the combined induction of TGF-β and IL-6. TGF-β promotes Th17 cell differentiation by up-regulating the expression level of IL-23 receptor (IL-23R). TGF-β also promotes the expression of forkhead box P3 (Foxp3) and RORγt. Foxp3 inhibits the expression of RORγt. Therefore, when the concentration of TGF-β is too high, high expression of Foxp3 is induced to antagonize the differentiation promoting action of the transcription factor RORγt, thereby inhibiting the differentiation of Th17 cells . The role of Foxp3 is inhibited by IL-6 and IL-21. 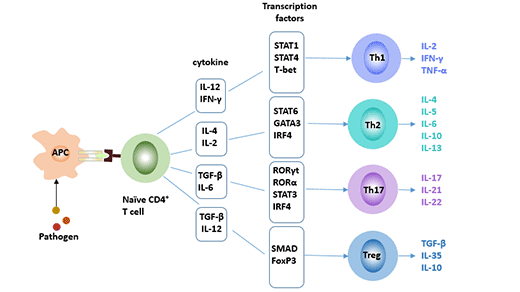 Cytokines such as TGF-β, IL-6 and IL-21 complete the differentiation of Th17 cells through complex regulatory mechanisms. IL-6 is an important immunoregulatory factor and plays an important role in the early stages of various immune responses. IL-6 can directly act on T cells and induce STAT3 activation by signal transduction of tyrosine residues of gp130. STAT3 can induce the expression of Th17 cell-specific transcription factors RORγt and RORα to promote the differentiation of Th17 cells. The IL-6-gp130-STAT3 pathway is required for the differentiation of Th17 cells. Blocking IL-6-gp130-STAT3 can be an effective measure to control autoimmune diseases induced by Th17 cells. Furthermore, IL-6 induces IL-23R expression and differentiation of Th17 cells by endogenous TGF-β. In the absence of IL-6, IL-21 can replace IL-6 and TGF-β to induce differentiation of Th17 cells  and release IL-21. IL9 is a cytokine produced by Th2. Thl7 cells also express IL9. IL-9 can induce Thl7 cell differentiation in synergy with TGF-β, and its induction efficiency is similar to that of TGF-β+IL-21-induced Th17 differentiation. IL-1 plays a signal-regulating role in the early differentiation of Th17 cells . In the absence of exogenous TGF-β, IL-1 synergizes with IL-6 and IL-23 to promote the differentiation of Th17 cells. IL-1R1 expression is up-regulated during Th17 cell differentiation. IL-1R1 expression was mainly affected by IL-6, and IL-23 and TGF-β had little effect on IL-1R1 expression. IL-1R1 expression is also dependent on STAT3, RORα and RORγt. Amplification phase is mainly mediated by IL-21. The cytokine IL-21 is secreted by Th17 cells themselves, which may promote or maintain the differentiation of Th17 cells by autocrine. The expression of IL-21 is dependent on STAT3. STAT3 can directly bind to the secretory IL-21 promoter, induce Th17 cells to reproduce IL-21, and form the STAT3-Th17-IL-21 autocrine loop . 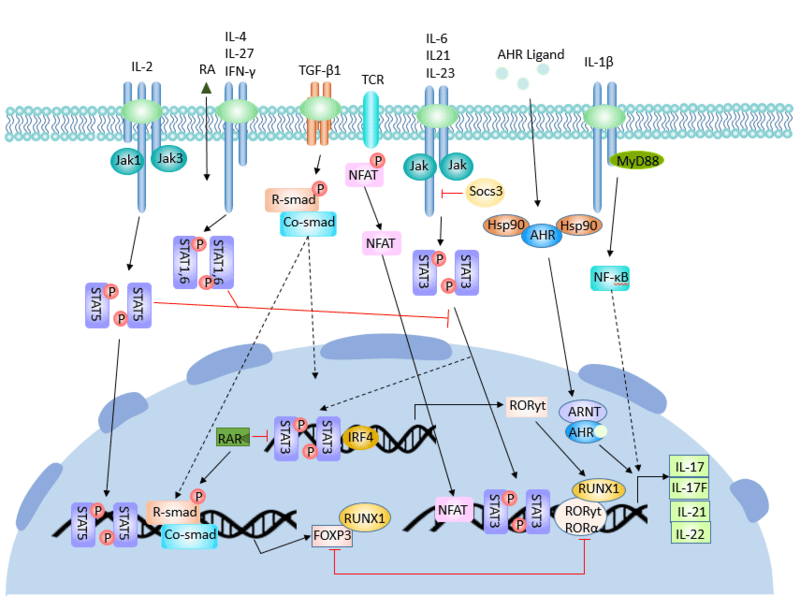 IL-21 can be induced by IL-6 and up-regulates the expression of IL-23 receptor together with IL-6. IL-21 not only promotes the amplification of Th17 cells, but also maintains its phenotypic stability. Stable phase is mainly maintained by IL-23. Although IL-23 is not involved in the early differentiation of Th17 cells, it is an important cytokine that regulates the immune function of Th17 cells, and has a function of promoting the proliferation of Th17 cells and maintaining the stability of cell subsets. Among the mechanisms of autoimmune diseases, IL-23 is an important effector factor that promotes immunopathological damage caused by Th17 cells, and plays an important role in the induction of autoimmune diseases such as EAE and collagen arthritis. IL-23, together with TGF-β, IL-6 and IL-21, can up-regulate the expression of IL-23R on the surface of Th17 cells and promote the production of IL-17A, IL-17F and IL-22. IL-23 binds to its receptor and activates the JAK-STAT signaling pathway, which leads to phosphorylation of Jak2 and Tyk2, which in turn promotes the phosphorylation of signal transduction and activator of transcription1 (STAT1), STAT3, STAT4 and STAT5. The cytokine IL-23 may also up-regulate IL-17 expression by activating the STAT3 signaling pathway . IL-1 also plays an important role in the expansion and stabilization of Th17 cells. IRF4 (Interferon-regulatory factor 4) factor is also a key component of Th17 cell development. Brustle et al. found that IRF4 has a positive effect on the differentiation of Th17 cells. Activation of STAT3 is necessary for IL-6 and IL-2 to regulate Th17 differentiation. Deletion of STAT3 results in a significant decrease in the expression of Th17 cell-specific transcription factors RORγt and RORα, while Foxp3 expression is increased. Foxp3 inhibits RORγt-mediated IL-17 mRNA transcription by directly binding to RORγt, thereby affecting the function of Th17 cells . When STAT3 is hyperactive, the expression of ROR γt is increased, which inhibits the expression of Foxp3, thereby inhibiting the differentiation of CD4+ T cells into Tregs and promoting the proliferation of Th17 cells. In addition, STAT3 can also enhance the ability of Th17 cells to respond to IL-23 and up-regulate the expression of IL-17 by the inhibitory factor of SOCS3. RORγt (orphan nuclear receptor gamma t, RORγt) is a Th17 cell-specific transcription factor. 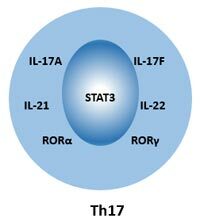 RORγt is continuously expressed during the differentiation of Th17 cells and controls the expression of important cytokines such as IL-17. It induces differentiation of primary CD4+ T cells into Th17 cells, and IL-17 expression is also dependent on its presence. Compared with RORγt, RORα had a weak ability to promote Thl7 cell differentiation, which seemed to play a synergistic role in the expression of Th17 cells. IL-27 is a cytokine that inhibits the differentiation of Th17 cells, and STAT1 is involved in this inhibitory effect. IL-27 deficiency will lead to hyperfunction of Th17 cells and promote inflammatory responses in the central nervous system . Recent studies have found that IL-2 is a suppressor of Th17 cell differentiation. The mechanism by which IL-2 inhibits Th17 differentiation requires the involvement of STAT5 . IL-2 can phosphorylate STAT5 and directly bind to the promoter of IL-17 gene to inhibit the expression of IL-17. In addition, IL-2 significantly reduced the expression of RORγt. STAT1 inhibits the differentiation of Th17 cells. On the one hand, STAT1 attenuates STAT3 activity by up-regulating SOCS3 expression; on the other hand, STAT1 inhibits TGF-β-mediated Smad transcriptional activity, thereby inhibiting Th17 cell differentiation. Current experiments have shown different effects of STAT5 on Th17 cell differentiation. Yang et al. found that overexpression of active STAT5 did not affect Th17 cell differentiation, while some studies found that STAT5 was involved in mediating the inhibitory effect of IL-2 on Th17 differentiation. Suppressor of cytokine signaling 3 (SOCS3) is a group of proteins that inhibit the signal transduction of Janus kinase (JAK) and STAT signaling in the differentiation of Th17 cells. It acts as a negative regulator. Mechanism of action of Socs3: Socs3 restricts the phosphorylation of STAT3 and inhibits the binding of STAT3 to the IL-17A/F promoter, thereby inhibiting the production of Th17 cells. IL-6 and IL-21 can promote the expression of cytokine signaling inhibitor 3 (SOCS3). In contrast, TGF-β inhibits SOCS3. Moisan J et al. showed that Ets-1 is a negative regulator of Th17 cell differentiation. Ets-l inhibits the differentiation of Th17 cells by regulating the expression of IL-2. IFN-γ can block the action of Smad3 on TGF-β receptor by inhibiting the phosphorylation of Smad3, thereby interfering with the process of TGF-β-induced Th17 cell differentiation. Th17 cells mediate inflammatory responses mainly by secreted cytokines such as IL-17, IL-21, IL-22, IL-26, and tumor necrosis factor α (TNF-α), and play an important role in the development of extracellular pathogen infection, tumor, transplantation rejection, and autoimmune tissue injury. Among the cytokines secreted by Th17 cells, the most important effector molecule is IL-17. The cytokine family includes 6 members of IL-17 (A ~ F) and 5 receptors (IL-17RA ~ IL-17RD and SEF). The main biological effect of IL-17 is to promote inflammatory responses, which play an important role in host immunity against bacterial infection. IL-17A can induce the expression of IL-6, acute phase protein (APP), granulocyte colony-stimulating factor (G-CSF) and prostaglandin E2 (PGE2), and enhance the proinflammatory effect together with TNF-α; IL-17A also increases the growth of vascular endothelial cells, thereby promoting angiogenesis. IL-17F and IL-17A have the most homology at the amino acid level, and also have overlapping effects in different autoimmune diseases . Th17 cells play an important regulatory role in autoimmune diseases, infectious diseases, and transplant rejection. Numerous studies have shown that IL-17 is significantly associated with autoimmune diseases such as experimental autoimmune encephalitis (EAE), asthma, and rheumatoid arthritis (RA). Rheumatoid arthritis (RA) is a chronic autoimmune disease, its pathogenesis remains unclear. In the occurrence and development of rheumatoid arthritis, the activation of Th17 cells and their cytokines play a crucial role . CD4+ T cells can produce a large amount of IL-17 after stimulation with IL-23. IL-17 can stimulate the expression of various chemokines, further inducing neutrophils, macrophages and lymphocytes to accumulate in the synovial tissue. Then, the differentiation, proliferation and functional stability of pathogenic T cells cause synovial tissue hyperplasia and synovial degrading enzymes, which ultimately leads to synovial inflammation in rheumatoid arthritis patients. Th17 is an important effector cell and target cell of inflammation, which plays an important role in the process of chronic inflammation. The balance of Th17/Treg in the body is an important regulatory mechanism for the occurrence of infection and the severity of infection. 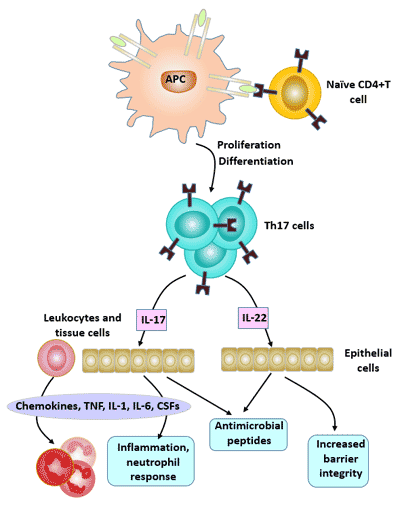 Th17 cells are important lymphocytes involved in infectious diseases. Cytokine IL-23 can induce the development of Th17 and promote the secretion of other factors (such as IL-17, IL-6, IL-8, etc.). Most current studies suggest that Th17 cells can promote tumor development . The study found that  IL-17 can promote tumor growth in mice. However, some studies have suggested that Th17 cells can inhibit the development of tumors . Park H, Li Z, Yang X O, et al. A distinct lineage of CD4 T cells regulates tissue inflammation by producing interleukin 17 [J]. Nature Immunology, 2005, 6(11): 1133-1141. Harrington L E, Hatton R D, Mangan P R, et al. Interleukin 17-producing CD4+ effector T cells develop via a lineage distinct from the T helper type 1 and 2 lineages [J]. Nature Immunology, 2005, 6(11): 1123-1132. Cua D J, Sherlock J, Chen Y, et al. Interleukin-23 rather than interleukin-12 is the critical cytokine for autoimmune inflammation of the brain [J]. Nature, 2003, 421(6924): 744-748. Croxford A L, Mair F, Becher B. IL-23: One cytokine in control of autoimmunity [J]. European Journal of Immunology, 2012, 42(9): 2263-2273. Carrier Y, Gao W, Korn T, et al. Reciprocal developmental pathways for the generation of pathogenic effector TH17 and regulatory T cells [J]. Nature (London), 2006, 441(7090): 235-238. Zhou L, Lopes J E, Chong M M, et al. TGF-beta-induced Foxp3 inhibits T(H)17 cell differentiation by antagonizing ROR gamma t function [J]. Nature, 2008, 453(7192): 236-40. Monteleone G, Pallone F, Macdonald T T. Interleukin-21: a critical regulator of the balance between effector and regulatory T-cell responses [J]. Trends in Immunology, 2008, 29(6): 0-294. Chung Y, Chang S H, Martinez G J, et al. Critical Regulation of Early Th17 Cell Differentiation by Interleukin-1 Signaling [J]. Immunity, 2009, 30(4): 576-587. Wei L, Laurence A, Elias K M, et al. IL-21 Is Produced by Th17 Cells and Drives IL-17 Production in a STAT3-dependent Manner [J]. Journal of Biological Chemistry, 2007, 282(48): 34605-34610. Mathur A N, Chang H C, Zisoulis D G, et al. Stat3 and Stat4 Direct Development of IL-17-Secreting Th Cells [J]. The Journal of Immunology, 2007, 178(8): 4901-4907. Floess S, Freyer J, Siewert C, et al. Epigenetic Control of the foxp3 Locus in Regulatory T Cells [J]. PLoS Biology, 2007, 5(2): e38. Ichiyama K, Yoshida H, Wakabayashi Y, et al. Foxp3 inhibits ROR gamma t-mediated IL-17A mRNA transcription through direct interaction with RORgammat [J]. Journal of Biological Chemistry, 2008, 283(25): 17003-17008. Tone Y, Furuuchi K, Kojima Y, et al. Smad3 and NFAT cooperate to induce Foxp3 expression through its enhancer [J]. Nature Immunology, 2008, 9(2): 194-202. Cobb B S, Hertweck A, Smith J, et al. A role for Dicer in immune regulation [J]. Journal of Experimental Medicine, 2006, 203(11): 2519-2527. Li B, Carey M, Workman J L. The Role of Chromatin during Transcription [J]. Cell, 2007, 128(4): 0-719. Moisan J, Grenningloh R, Bettelli E, et al. Ets-1 is a negative regulator of Th17 differentiation [J]. Journal of Experimental Medicine, 2007, 204(12): 2825-2835. Chaudhari S S, Moussian B, Specht C A, et al. Functional Specialization Among Members Of Knickkopf Family Of Proteins In Insect Cuticle Organization [J]. Plos Genetics, 2014, 10(8): e1004537. Leipe J, Grunke M, Dechant C, et al. Role of Th17 cells in human autoimmune arthritis [J]. Arthritis & Rheumatism, 2014, 62(10): 2876-2885. Iwahashi. Tumor-infiltrating CD4+ Th17 cells produce IL-17 in tumor microenvironment and promote tumor progression in human gastric cancer [J]. Oncology Reports, 2011, 25(5). Numasaki M, Fukushi J I, Ono M, et al. Interleukin-17 promotes angiogenesis and tumor growth [J]. Blood, 2003, 101(7): 2620-2627. Yang L J, Qi Y X, Hu J, et al. Expression of Th17 Cells in Breast Cancer Tissue and Its Association with Clinical Parameters [J]. Cell Biochemistry & Biophysics, 2012, 62(1): 153-159.